Room tip: Try and get a room over the pool, unlightly if you are English. We too, are very disappointed to see you were less than satisfied with the arrangements for the meeting you held at our property. Excellent guest satisfaction is of enormous importance to us and on reading this review we conducted an investigation to ascertain how this could have happened. Our guest’s opinions are always very important for us in order to increase our quality, therefore we thank you very much for your helpful comments. Despite of everything, we sincerely hope to welcome you back to Zefir Beach Hotel again one day! We went to this hotel the last week in September, On arrival the room had a cracked sink and the balcony door would not lock. They changed rooms for us and this also had a balcony door that would not lock, they did come and fix it first thing the next day. Though to be honest the balcony was so small you could hardly sit on it. There was one plug socket which was loose and dodgy to use. The rooms were never cleaned the whole week we were there, staff came in the room every day to make the bed (though just to fold the sheets as pillows were left) and to replace toilet rolls. Towels weren't changed at all. The food in the hotel was always cold, we didn't have a hot meal the whole week. They definitely cater for the Germans. Very difficult getting a hot drink unless it was meal time, no hot drinks after 9.00pm even though we were all inclusive, take your own travel kettle. Seems the Germans had a different colour band for all inclusive and this was 24 hour, English were not allowed to upgrade to this banding!! The staff were very rude and never smiled!! The only member of staff worth a mention was Thomas at the pool bar, he was brilliant and always smiled and chatted with everyone. The other staff wore their own clothes and mainly jeans, some even wore their coats in the dining room. Very unprofessional. On the up side, its very close to the beach, 100m, the small train comes past every 20 minutes and takes you every where for 3 levs. Nessebar is definitely worth a visit, its lovely. The centre of Sunny beach is full of market stalls, bars, clubs and the beach, very lively. The bar across the road from the hotel is also worth a visit, good food and cheap drinks. Thank you very much for the time you spent in writing and sharing your honest opinion and experience at Zefir Beach Hotel. All feedbacks from our precious guests are so important and help us to improve our quality of service. At Zefir Beach Hotel we strive to provide a superior service experience for every customer; therefore, your feedback is of great importance to us. Furthermore we are glad you noted the quick reaction from our team members to resolve any problems. In spite of everything, we sincerely hope to welcome you back to Zefir Beach Hotel again one day! dreamy vacay in cozy hotel. Went to Sunny Beach already several times. Me and my parents are always loved this place. But this time was even better then the others. Hotel was just AMAZING. It should be 3 star hotel, as we understood bud we felt like it was definitely at least 4 stars. Rooms were cozy and okay to have a leisure vacay, everything what is needed was there. Cleaners were very friendly and did job well. Breakfast was JUST amazing. I don't know who was the guy who fried eggs outside, but he should get some kind of award cuz, i haven't get this good eggs nowhere. Well done. And the same words to guy who did the pancakes, it's nice to go to breakfast when stuff already have smile on the faces and do some jokes. The hotel, rooms and all the area was very clean also. Guys at outside poolbar were also amazing, didnt get a change to see them without smile :)! Also animatsion team. Thank You Tsetso for the perfect morning waking up training. It was just perfect. Also sportsanimator was very enthusiastic eventho there wasnt many people who joined him with activities. There was one little thing.. if You go to the hotel what is new for You. You wait at least the question in front desk " Is it Your first time in our hotel? " or at least they should show to customer where can they get breakfast or where is the room.. and smile, girls, smile is what saves the first impression. And also, good english from most of the sutff! and PS! if You are going to Zefir, be sure that you dry the donuts!!! AND BEST PASTA CARBONARA WHAT YOU CAN EVER GET!!!!!!!! So.. thank You ALL very very very much!! Thank you for praising us with your review and compliments to the hotel and to our location, staff, room and culinary offer. Looking forward to the day when we welcome you back to the hotel. Much the same views as those of Chloe F.
We stayed from 20th September for 7 nights and found the hotel very good indeed. We too had reservations after reading previous comments, but these were totally unfounded and found everything very good. All the bar staff were excellent and enjoyed a bit of banter and a good laugh. I don't think they receive the same from German guests, so if you are prepared to have banter with them, you will receive the same in return. Food is fine, and always something to suit all tastes in our opinion. The BBQ area staff were always cooking fresh food, such as Omelettes, fried eggs, Pizzas, Pasta etc. and this was always excellent. It is not a five star hotel and we never expected it. If you want 5* then you have to pay for it! I thoroughly recommend the Hotel, but not necessarily the resort of Sunny Beach. Too much like Magaluf and other such places which gear up for the party going types! We are not young anymore, but probably suits the younger generation. All in all a great stay at the Zefir, and thoroughly recommend it. Many thanks for your nice review here on TripAdvisor! Our staff go above and beyond for our valued guests, and they really appreciate your kind words. Furthermore we are very happy that we could meet your taste with our delicious fresh culinary offer. Looking forward to your next stay. Honest review - very good! 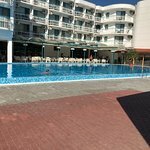 Me and my partner stayed here for 7 nights all inclusive on the 16th of September 2018 after only booking the night before. I was a little dubious after reading a number of negative reviews but I don’t normally let that put me off.. we were pleasantly surprised! Firstly- the hotel doesn’t look like much from the outside really but as soon as you walk in it is beautifully modern and very clean. The room itself was neutral and had a fridge hidden away in a cupboard which was handy (when we found it). If you want your towels changing you need to leave them on the floor otherwise they won’t take them. POOL- they had a new one put in during winter this year so it was lovely and new, always clean and very big! There’s also a small shallow pool for children. There were plenty of sun beds and never struggled to get one no matter what time of day it was. FOOD- I have seen so many bad reviews on food but I thought it was great - there is plenty of selection inside but also a BBQ area outside where they cook fresh pizzas, pasta, kebabs, meats and seasoned chips which are all also included which was excellent! Throughout the day there was ice-creams and mini fresh donuts available from 3-5 as well as other snacks such as pizza too - also included. STAFF- I found all staff very friendly and helpful and they DO NOT discriminate against the English at all like others are saying. Yes there were lots of German guests and yes they were very rude and arrogant but that is not the hotels fault. If you need to change money then use the hotel to do so as they seemed to offer the best rates. Also, things were beginning to close down towards the end of our stay in terms of markets, fair rides etc. because their season was coming to an end so bear that in mind if you’re planning on visiting towards the end of September. 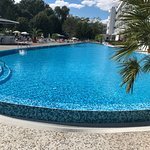 Overall, the hotel is in perfect location as you can get the little train outside straight to sunny beach, or another train 2 mins up the road to Nesebar where there are plenty of things to do. The beach is also right next to the hotel literally a 2 min walk which was good. We had a great experience and would definitely go again. Don’t listen to all the horrible reviews, people love to moan and at the end of the day if you want a five star experience then pay for it and don’t stay at a three star hotel! Many thanks for your kind words following your recent stay with us at Zefir Beach Hotel. Our entire staff takes pride in keeping the hotel in amazing shape for our guests. We cannot wait to share your comments with them. Thank you for highlighting the great food quality. Our aim is to achieve always a high standard and to give the best service to our guests. 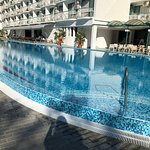 It's always a pleasure to welcome you in our little paradise in SunnyBeach and we can't wait to welcome you here soon again. I came here with my family partner for a nice relaxing get away, it was an extremely discriminative hotel to all whom are English- no air conditioning, no warm water, plastic cups and rude stuff all because of being English! Wouldn’t recommend to anyone I’ve never felt so disappointed! Bulgaria is an amazing country so we didn’t mind it all too much but no one ever spoke to us and we had no help or leaflets from reception! Bar staff were rude and rolled there eyes at you constantly! It was pleasure to welcome you to Royal Hotel. Thank you for taking the time to share your review. First and above all we would like to state that we are very sorry for the tough break that you experienced in our hotel. We consistently try our best to serve our guest equally regardless of their status such as, religion, language, nationality and cultural diversity for many years. We terribly apologize on behalf of the other guest for the things you have experienced. The unfortunate incident that you faced has been carefully examined by us. We would like to state that besides we are responsible for our entire guests’ safety and security that occasionally we do face experiences related to arguments between guests. Nevertheless in these kind of situations we would like to point out that we are to warn the stated guest on the first encounter, if repeated, it is subject to provide their early check out from property through their agency itself. Do hope you will reconsider and give us another opportunity to welcome you back.